What's the difference between dis- and mis- or between un- and non-? This negative prefix list can help you understand the prefixes that can change a word's meaning into its opposite. Note: I have added the parts of speech (verb, adjective, noun) to the prefix list examples because some people have been looking for negative adjectives or negative verbs. Dis- can be used with verbs, nouns, adjectives or adverbs. It also has other meanings besides making words negative. Mis- (often from Old English, or in some words from French) is used with verbs (and adjectives and adverbs made from them), as well as nouns. It means bad, wrong, or wrongly. Non- usually means not, but also may mean lack of something. Note that sometimes one prefix is used for an adjective, and different ones are used for related nouns or verbs. To deactivate is to make something inactive. Usually, however, the same prefix serves both adjective and noun: uncertain, uncertainty; unwilling, unwillingness; unfriendly, unfriendliness, inadequate, inadequacy, disloyal, disloyalty, etc. Examples: deactivate, decode, decommission, decompose, deconstruct, decontaminate, decrease, deflate, deflect, deform, demythologize, derail, detract. The list above is all verbs. Any of them could be made into adjectives by adding -ed (or -d if the verb ends in 'e' already: decoded, deflated, etc.) Several could also be made into nouns: deactivation, decomposition, decontamination, deflation, etc. Decrease can be used as a noun as it is. Examples (verb/ adjective/ noun or vb/ adj when all or both are common): disaffected (adj. ), disagree/ disagreeable/ disagreement, disbelief (noun), dishonor (vb. or noun)/ dishonored or dishonorable, disinfect/ disinfected/ disinfection, disinherit/ disinherited, disloyal (adj.) & disloyalty (noun), displease/ displeased or displeasing/ displeasure, disproportionate (adj. ), distasteful (adj.) and distaste (noun), distrust (vb. or noun)/ distrustful (adj.). In- often changes to 'il-' before l; 'im-' before b, m, or p; and 'ir-' before r. These changes make it easier to pronounce. Adjective Examples: illegal, illegible, illiterate, illogical, immature, impatient, imperfect, impossible, imprecise, inaccessible, inaccurate, inadequate, inappropriate, incapable, incoherent, incompatible, incomplete, inconceivable, inconsistent, incredible, indefinite, indiscreet, inevitable, infinite, inflexible, insecure, insignificant, insubordinate, insufficient, invalid, invariable, invisible, involuntary, irrational, irregular, irrelevant, irreparable, irresistible, irresponsible, irreversible, etc. A few noun examples using the same roots: illegibility, illiteracy, immaturity, impatience, imperfection, impossibility, imprecision, inaccessibility, inaccuracy, inadequacy, inappropriateness, incapability, incoherence, incompatibility, incompleteness, inconsistency, indiscretion, inevitability, infinity, inflexibility, insecurity, insignificance, insubordination, insufficiency, invalidity, invariability, invisibility, irrationality, irregularity, irrelevance, irresponsibility. Most of these do not have verb forms. Exceptions in which ‘in-‘ does not negate, but intensifies: Inflammable has the same meaning as flammable-- something that burns easily. Their opposite is nonflammable. The same is true for habitable and inhabitable (the negative is uninhabitable). Valuable and invaluable also are synonyms— except that invaluable is even stronger. It means something is priceless: so valuable that a person would not want to give it up for any amount of money. Examples: misconduct (noun), misdemeanor(noun), misdiagnose (to diagnose wrongly)/ misdiagnosed/ misdiagnosis, misinform/ misinformed/ misinformation, misinterpret/ misinterpreted/ misinterpretation, mislead/ misled or misleading, misplace/ misplaced, misspell/ misspelled/ misspelling, mistake/ mistaken/ mistake, mistrust (both a noun and a verb, but weaker than distrust), misunderstand/ misunderstood/ misunderstanding. A misdiagnosed disease has been diagnosed incorrectly, as compared to an undiagnosed disease, which has not been diagnosed at all. Similarly, a misinformed person has been given wrong information, while an uninformed person simply does not know much about a subject. You can also listen to an audio version of the article and find definitions of all its key words. Examples-- nouns: nonconformist or nonconformity, nonentity, nonexistence, nonintervention, nonsense, etc. Adjectives: nonconforming, nonexistent, nonmetallic, nonpartisan, nonresident, nonrestrictive (but unrestricted), nonsensical, nonstop. I can't think of any verbs that begin with non-. Some words can be negated either with non- or with another negative. In those cases non- has a more neutral connotation. For example, nonstandard means not according to the usual standard, but substandard is below the standard: not good. Nonreligious means not religious, but irreligious means more actively opposed to religion. (Adjective) Examples: unable, unacknowledged, unaffected (not affected at all; disaffected means affected badly), unafraid, unaided, unaltered, unambiguous, unanticipated, unapproachable, unassigned, unattainable, unavailable, unaware, unceasing, uncertain, unclear, unconventional, uncooperative, uncoordinated, unenforced, unexposed, unfocused, unfriendly*, unhelpful, uninformed, unknown, unmodified, unnatural, unpleasant, unpredictable, unprofessional, unrealistic, unrefined, unresolved, unscheduled, unstable, untouched, unwilling, etc. A few of these have related nouns including unavailability, uncertainty, unenforceability, unpleasantness, unpredictability, unreality, and untouchability, as well as inability, instability, and irresolution. Some also have related adverbs: unambiguously, unceasingly, uncertainly, unconventionally, unnaturally, unpleasantly, unpredictably, unprofessionally, unrealistically, unwillingly, and possibly others. Very few are verbs: undo and (only informally, on Facebook) unfriend. You can find the negative prefixes on that page both in the main list and sometimes pointed out, especially when different forms of a word take different negative prefixes. Other prefixes, besides the 6 on this negative prefix list, can also give a negative connotation to words. (Note 'sub-' above.) A- an-, anti-, contra- counter-, and ob- also often negate the meaning of a root. (For examples, see List of Prefixes for each of these, or the Facebook Comments below for a-: amoral-- not moral, etc.) The six at the top of this page are used the most in common English, however. They are worth knowing! The best way to learn the different negative prefixes is to work (or play) with them. You can do both on Practice Negative Prefixes. It emphasizes academic vocabulary, so is also a good way to review about 60 common words on the Academic Word List. You can also see how some of these negative prefixes (de-, in-, and un- ) are used in Word Families, Word Family Practice, and Word Formation Examples & Exercises. 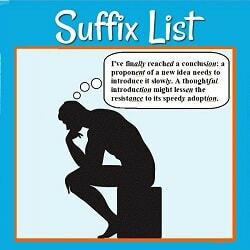 Understanding suffix use in English can give a big boost to your vocabulary too. See Suffix List or List of Suffixes. If you teach English, br sure to check out Root, Prefix, and Suffix Worksheets. The Common Prefix packet contains printable pdf lessons with all the information from this page, the List of Prefixes, and a great deal of practice (with negative prefixes as well as all the most common prefixes). There are also root, suffix, and combination packets.